EB Brands MEGA CHILL Yard Play Large Inflatable Cooler Just $12.61! Down From $59.99! You are here: Home / Great Deals / EB Brands MEGA CHILL Yard Play Large Inflatable Cooler Just $12.61! Down From $59.99! Sears has this EB Brands MEGA CHILL Yard Play Large Inflatable Cooler on sale for $12.61 (Reg. $59.99)! 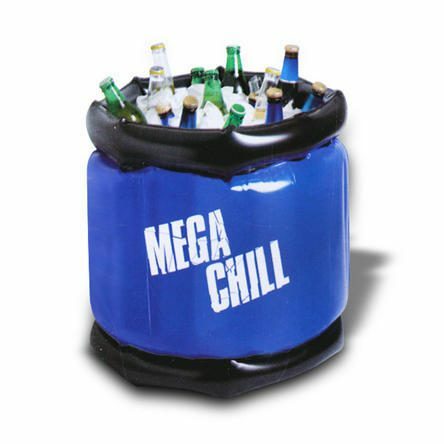 The MEGA CHILL Yard Play Large Inflatable Cooler inflates to keep your drinks and snacks cool wherever you go. It is compact and lightweight but inflates to a huge capacity – holding more than 40 cans or bottles, plus ice! It is built tough with heavy gauge PVC material, so it resists puncturing and tearing. When you are done, it deflates and folds to the size of a notebook – no more over-stuffing your car with a cooler!